Sarah C., Mark R., Evelyn B., Jamie R., Jordanna H., Joanne S., Farrow M., Paul K., Paul R., Deb B., Charlie F., Shauna M.
Established in 2015, Willow Arts Community is a non-profit arts and mental health organization operating out of Rodman Hall Art Centre, in St. Catharines, ON. 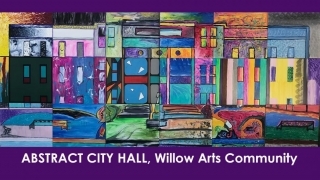 Willow Arts Community supports the creative goals of aspiring, emerging, and established artists with lived experience of mental health/addictions by providing a safe, nurturing environment where artistic projects, professional opportunities and personal and professional networks are developed and fostered. “Abstract City Hall” was created during a two-hour acrylics art class. Prior to the lesson, the instructor Mark Roe, multi-disciplinary artist and active Willow Arts Community member— took a photograph of City Hall, enlarged it and divided the image onto 18 reclaimed boards. The lesson was introduced to its members as “Fundamentals of Abstract Art”. They began by looking at famous artistic works that pushed the boundaries of visual arts, colour theory and technique. Each member was then given reclaimed art board with what appeared to be a random geometric design as a starting point. The group used the fundamentals they had learned to produce an abstract piece of art. Unknown to the members, the 18 art works when exhibited together would create one large collaborative abstract art piece of St. Catharines City Hall. The idea was to go beyond a two-hour acrylics art class and to reveal to the Willow Arts Community Members that they are a unique part of a larger picture. This exhibit reflects how local government, a national arts organization - Rodman Hall Art Centre, and individuals living with mental illness/addictions can come together to celebrate diverse artists in the community. The City Hall exhibit program is coordinated through the Cultural Services office of the Parks, Recreation and Culture Services department of the City of St. Catharines. The office is responsible for managing the Civic Art Collection and undertakes a range of public art projects. Exhibits in public spaces provide the City an opportunity to display original art, historic photos, or cultural treasures that reflect St. Catharines’ stories, creative self-expression, experiences, and perspectives. Exhibits can also be found at the FirstOntario Performing Arts Centre.